Krakow city council has decided that developers will not be allowed to build a shopping centre on the site of the defunct Cracovia Hotel. 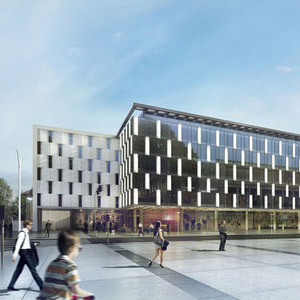 In a decision described as in keeping with the framework for the development of Krakow, councillors have ruled that the building may be demolished, but cannot be turned into a larger shopping area. The Cracovia Hotel, built in the 1960s and located near the Błonia meadow, opposite the main building of the National Museum in Krakow, is currently owned by Echo Investment, who want to knock the structure down and replace it with a much larger retail centre. On Saturday March 22, opponents of the project staged a protest march wearing gold-coloured clothing and denouncing what they called the greed of the investors. Vice-President of City Development, Elżbieta Koterba, said that the decision, which ends several months of negotiations, was not intended to please either the investors or the protesters. Some protesters want city planners to guarantee that the Hotel Cracovia will not be demolished, in recognition of its significance as an example of 20th century architecture. Conversely, the ban on turning the building into a shopping centre stands in the way of the owner’s project. The most recent proposal published by Echo Investment envisaged a 17,000 sq m development on the site. The city’s decision specifies that the owner cannot include a shopping area that exceeds 2,000 sq m.
The decision also prohibits building on the open area currently between the existing building and the pavement. ← Dear Luiza: To the Barricades!